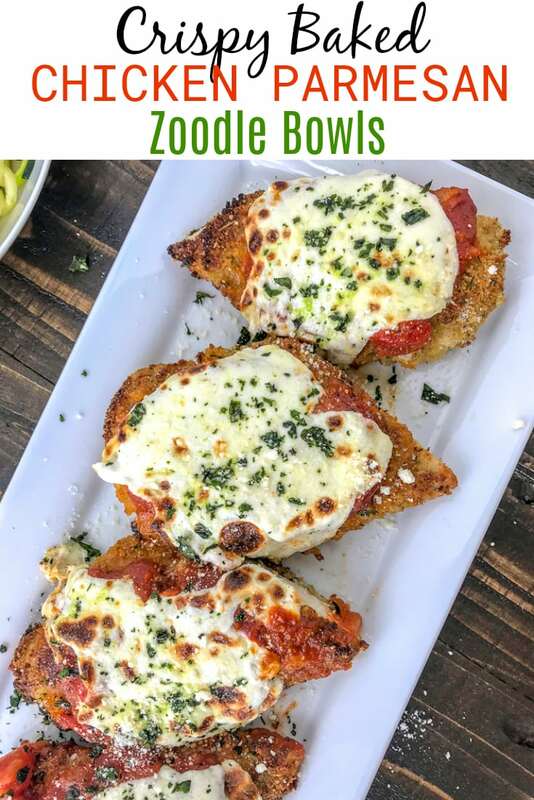 Crispy Baked Chicken Parmesan Zoodle Bowls – incredibly delicious chicken that is super tender on the inside, yet crispy on the outside. 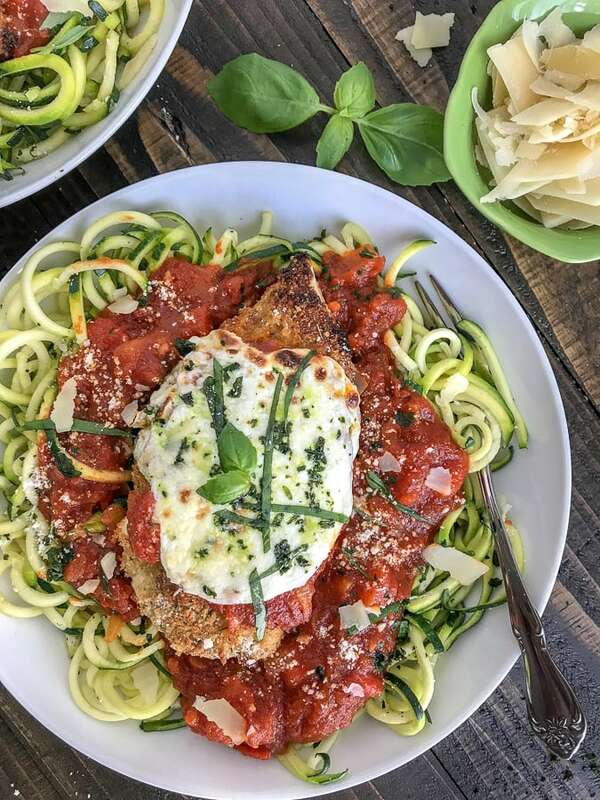 Served over cooked zucchini noodles to make for a lower-carb, light and healthy meal. 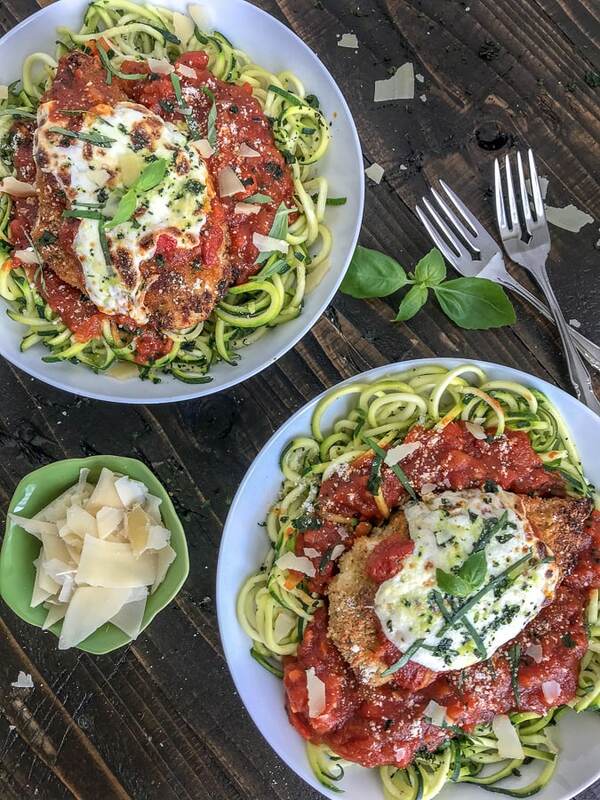 If you’re pressed for time or looking for a healthier version to the ever-so-comforting Chicken Parmesan dish, then you will love this Crispy Baked Chicken Parmesan Zoodle Bowls rendition! This dish can be on your table, from start to finish, in 20-25 minutes. Easy dinners are the best dinners! 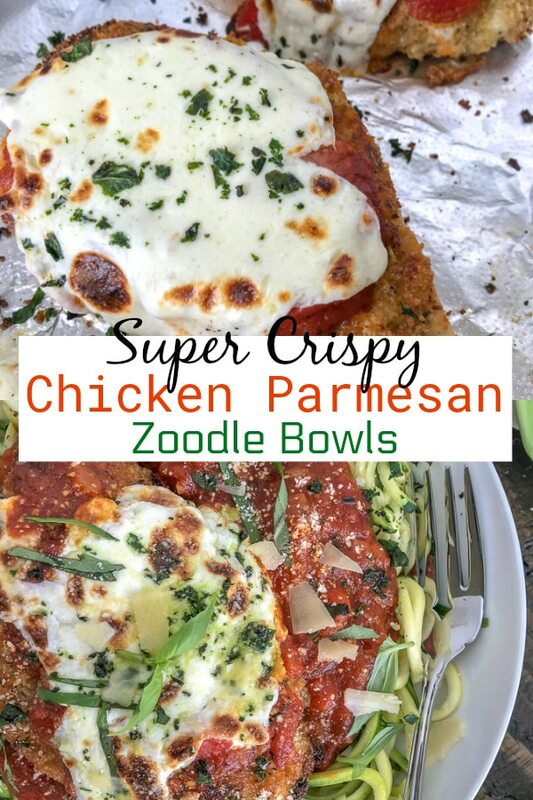 These Crispy Baked Chicken Parmesan Zoodle Bowls are so simple to make and they work perfect for those evenings when you don’t have a lot of time to put into a dish. They can be on your table in around 20-25 minutes – from start to finish. Sounds great, right? You’re welcome! This traditional comforting dish is a favorite of mine, but I know that won’t surprise you knowing my love for carbohydrates. I love anything with pasta. And I certainly love just about anything with crispy chicken. Let’s be honest here. 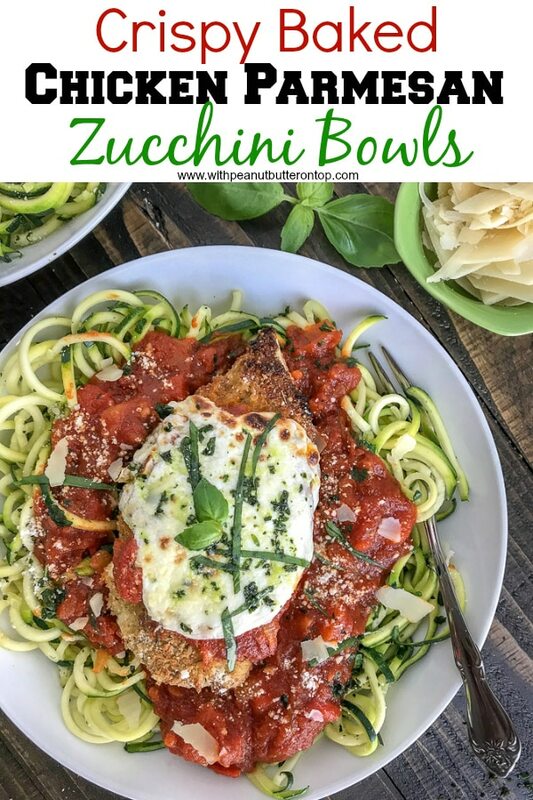 Although they are a much healthier option, zucchini noodles could never begin to compare to traditional, real noodles – they are still quite delicious and perfect for those times when you’re trying to watch what you eat. And it doesn’t hurt to increase your veggie intake! I prefer mine cooked as opposed to raw, but you’re more than welcome to serve them to your taste preference. This chicken is not only tender and juicy on the outside, but super crispy on the outside. Without being deep fried! Yep, you read that right. As delicious as frying foods can be, its not too friendly on the waistline or for the heart. So we must find creative/different ways to enjoy the foods we love. This wasn’t a time where I was being creative, though. This “idea” came about after I made an ‘oopsy daisy’ putting the recipe together. Only this oopsy daisy was a good oopsy daisy! I had everything set up on my kitchen island. I had the eggs beaten in one shallow dish and the breadcrumbs, parmesan cheese, and herbs mixed together in another shallow dish. The oven was preheating and my pans were ready. But apparently I was having one of those moments where my mind was on the project at hand, as well as being somewhere else – at the same time. Yikes! Go with the flow sometimes. But as I stood there staring at my coated chicken breast, I couldn’t help but think how I wanted them to have a bit of a thicker crumb coating. So I decided to try dipping the already breadcrumb coated breast into the beaten eggs and then dredge it through the breadcrumb mixture again for a second coating. I proceeded to do this with the next three chicken breasts, because it doesn’t hurt to try different ideas or methods, right? 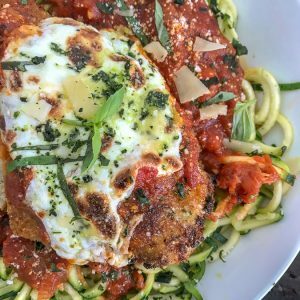 The best chicken parmesan – EVER! 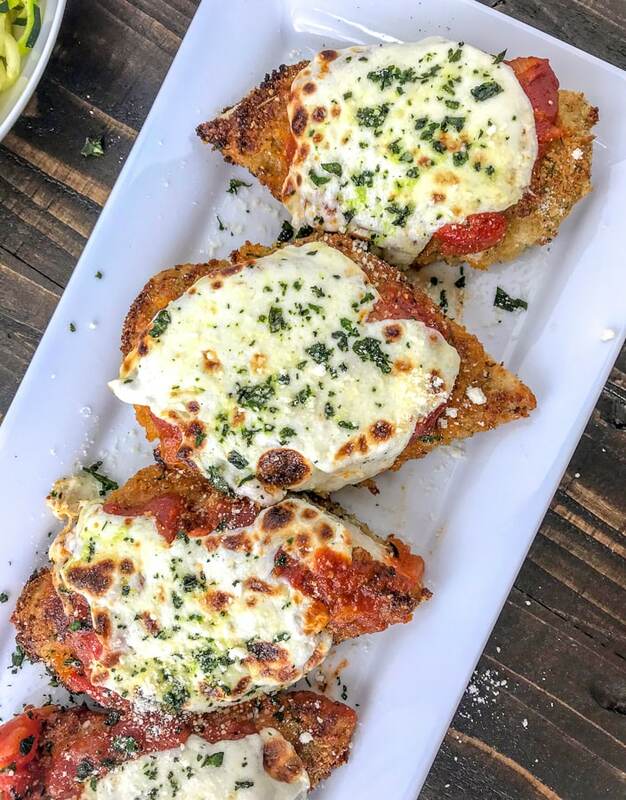 This chicken is first pan fried for a few moments to sear the outside and then finished to bake in the oven, topped with a delicious, chunky red pepper tomato sauce, fresh mozzarella cheese, and garnished with parmesan cheese and basil. 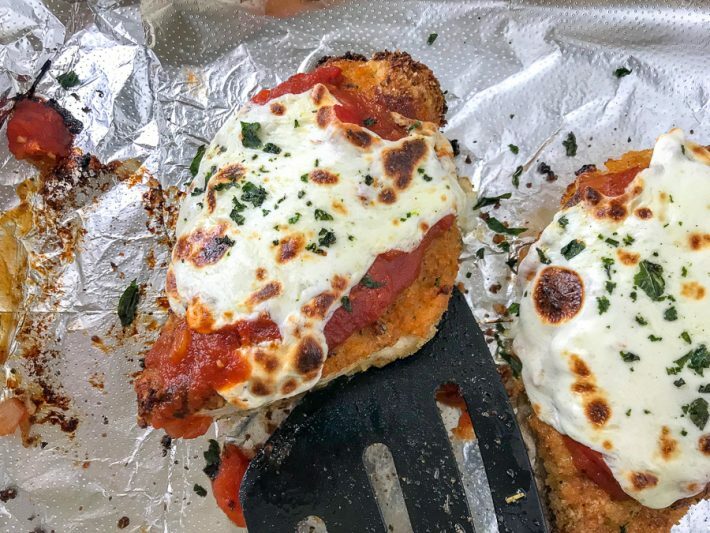 There are many different ways of making chicken parmesan. We all have our own techniques on what we feel is the “best method” or the “right combination” of ingredients. This is simply what worked for me with my diet and taste preferences. I certainly wouldn’t be sharing it with you if I didn’t feel that it was the bee’s knee’s! Some feel that it’s best to use regular breadcrumbs while others feel that using only panko breadcrumbs is the way to go. I decided to go with both, as I feel the regular breadcrumbs help to coat the chicken where the panko breadcrumbs would help to give it the crispy exterior that I was aiming for. Plus, it was something in my pantry that needed used up. Use thin-sliced chicken breast. These are generally called ‘Thinly-Sliced Chicken Breast Cutlets’. If you cannot find them, then simply slice two regular chicken breasts down the center from end to end. Using chicken breast on the thinner side will not only ensure more evenly cooked chicken, but it will also cook more quickly and it will be more tender. Many people believe in beating the chicken breast with a mallet or rolling pin to help tenderize the chicken by opening up the tissues. I do this from time to time with chicken, but it’s ok to skip this step if you’re pressed for time. I decided to sear the chicken in a large nonstick pan prior to placing them into the oven to finish baking. You can do either or. Simply make sure you increase the cooking/baking time. The internal temperature should reach 165 degrees F.
Keep your hands separate from one another during the coating process. One thing that I hate about coating anything is how goopy my fingers will get from start to finish. I end up having to stop midway to wash my hands and start again. It’s easier to keep your hands separate. For example: I used my right hand to run each chicken breast through the eggs and also transferred it with my right hand to place it into the breadcrumb mixture (without touching the breadcrumbs). I then used my left hand to firmly pat the breadcrumbs all over the chicken – even with flipping and patting firmly again. Use the tomato sauce of your choosing, but I do recommend trying this recipe with Bertolli’s Organic Tomato and Basil Sauce. So much flavor – especially with the additions I added! If you’re not a fan of zucchini noodles, use the pasta of your choosing. Or you can omit both and serve it with the side dish of your choice: salad, steamed broccoli, asparagus, etc. Use fresh mozzarella cheese for optimal flavor and cheesiness. You can find it with the specialty cheeses in any grocery store. All you have to do is slice the cheese. I promise it will be so much better than pre-sliced packaged mozzarella cheese. 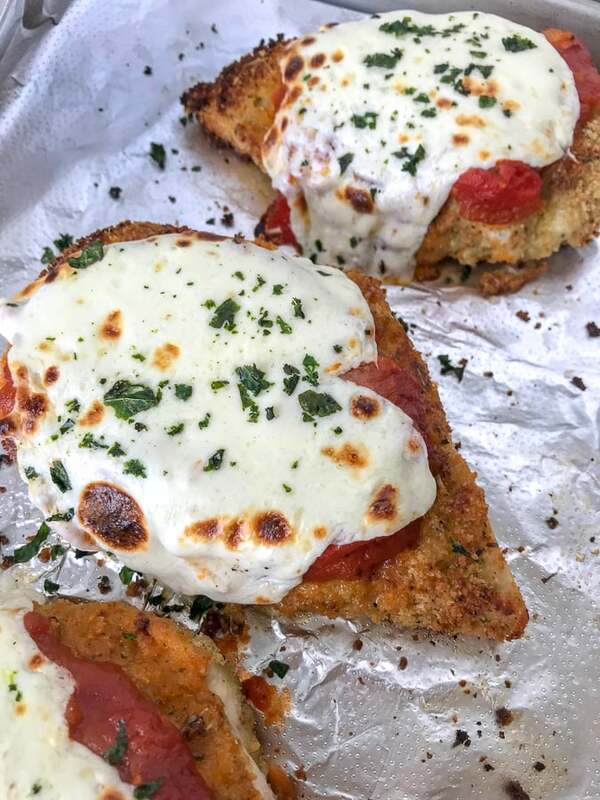 The best Chicken Parmesan you will ever make! Super easy to make and bursting full of flavor - from the tender, juicy inside to the crispy outside. This dish can be on your table in 20 minutes! Preheat the oven to 425 degrees F and prepare a baking sheet or dish by lining it with foil or by spraying it with nonstick cooking spray. Place a large nonstick pan over medium heat and spray with nonstick cooking spray. One heated, add the spiralized zucchini. Cook 3-5 minutes. * Remove to a bowl and place return pan to burner with 1 tablespoon of oil. Once heated, add the onion and roasted red pepper. Cook until onion is translucent. Add the garlic and allow to cook 2-3 minutes. Once the garlic is fragrant, add the sauce and lower to a simmer, stirring occasionally. To one shallow dish, add the eggs and thoroughly beat. To a second shallow dish, combine the both breadcrumbs, parmesan cheese, and seasonings. Sprinkle each chicken breast with a little salt and pepper, followed by a dash of garlic powder. All to taste. Dredge each breast through the egg and then through the breadcrumb mixture. Firmly pat the breadcrumb mixture to both sides of the chicken. Press the mix into the chicken to ensure a good coating. Place a *large nonstick, ovenproof skillet over medium-high heat with 2 tablespoons of olive oil. Once heated, add the chicken breast and sear each side for 3-4 minutes. Once the chicken has been seared on both sides, transfer the skillet (or baking dish) to the oven to bake 7-10 minutes. Time will be dependent on how thickly cut the chicken breast is. The internal temperature needs to reach 165 degrees F.
Add the zucchini noodles to the pan with the sauce to re-warm. Remove the chicken from the oven to add a scoop of sauce and mozzarella cheese. Place back into the oven for a few minutes. Long enough to melt the cheese. If you want a crispy, bubbly cheese coating - turn the broiler on high after the cheese has melted. Watch closely as this will only take but a moment or two. Remove from the oven. 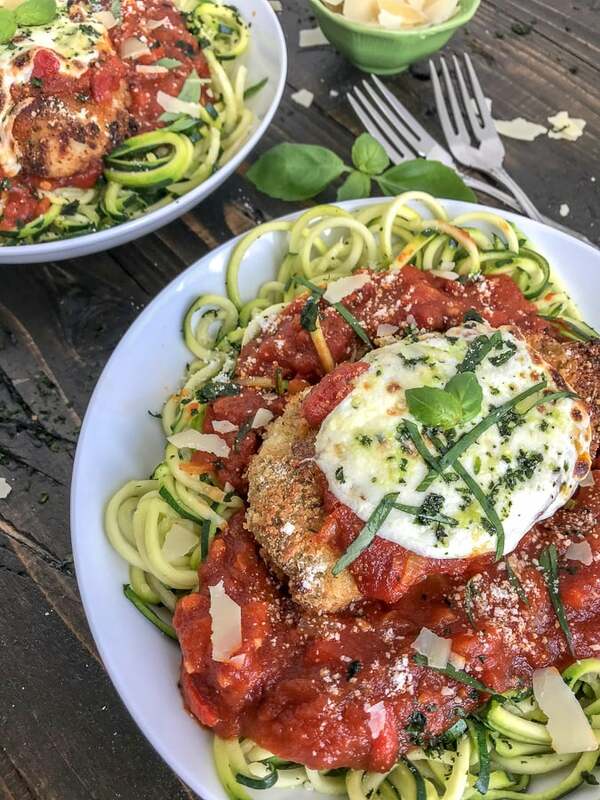 Serve with the zucchini noodles, garnished with fresh basil and parmesan cheese. 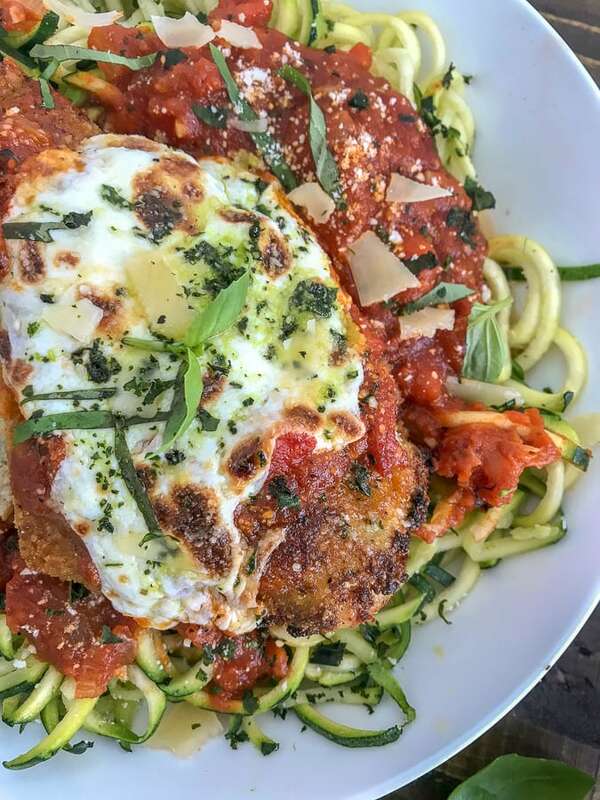 *Zoodles: Time will be dependent on how thick your zucchini noodles are, as well as how soft you prefer them. So keep an eye on them. *If you don't have an ovenproof skillet, use a regular nonstick pan and transfer the chicken to a coated baking dish or baking sheet to finish the baking process. If you can't fit all 4 breasts into the skillet, work in batches. Add 1 tablespoon of olive oil to the pan each time per two chicken breasts. Preheat the oven to 425 degrees F. Place each coated chicken breast onto a prepared baking sheet or dish. Bake for 15-20 minutes or until the internal temperature reaches 165 degrees F. Add the sauce and sliced cheese and place back into the oven for a few more minutes - long enough to melt the cheese. Place a large, nonstick skillet or pan over medium heat with 2 tablespoons of olive oil. Once heated, add the chicken breasts. Cook on each side 3-4 minutes. Flip once more and then add the cheese and sauce. Allow to cook long enough for the cheese to melt. Time will be dependent on how thickly cut the chicken is, so be sure to check the internal temperature with a meat thermometer. Internal temp should reach 165 degrees F.
Thank you, Sherry! Happy to hear you enjoyed it so much.